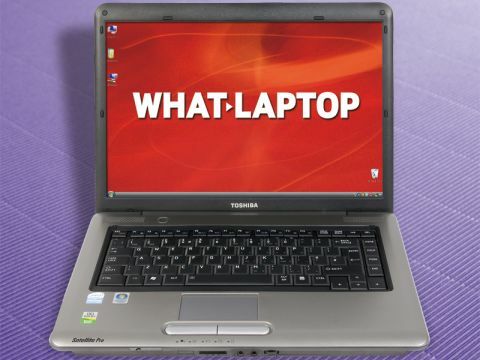 Toshiba's Satellite Pro range is aimed at the corporate user, providing a useful mix of quality build and great usability. The Satellite Pro A300-1OQ is an entry-level choice, and a great buy for the business person on a budget. We found the 15.4-inch screen bright and vivid, although we'd have preferred deeper blacks. As with all such panels, the glossy Super-TFT coating adds vibrancy, but also results in reflections, limiting use in brighter conditions. The 1280 x 800-pixel resolution is standard for this price point, providing reasonably crisp images. Basic multimedia use is offered by the integrated Intel graphics card, with enough performance to play DVDs or edit photographs. The integrated Intel GMA4500HD GPU benefits battery life, with the machine offering around four hours between charges. The A300 features one of the best keyboards available, matched only by the Lenovo, with quality to shame far more expensive machines. The keys are all of a good size, and there's no flex from the board as you type. The plastics used are sturdy and tactile, and the keys are all located in comfortable positions. The touchpad is wide and responsive, and the mouse buttons are large and offer great usability. The high-quality feel runs throughout the laptop, with strong plastics used for the chassis, and a design that feels like it's built to a much higher price point. We found the palm rests remained cool at all times, and it's a machine that you'll easily be able to use on a daily basis. Within the chassis, you'll find a budget Intel Pentium Dual-Core processor running at 2GHz. Backed by 1024MB of memory, it offers reasonable performance for day-to-day use, although it struggles when running several resource-intensive applications. As with a lot of other laptops, adding a further 1024MB of memory is an easy and affordable way of increasing performance. At 120GB, storage space falls behind that of the Advent 5611, but it's plenty for business use. Networking features are also impressive, with 802.11n Wi-Fi and Gigabit Ethernet both included. Four USB ports offer good connectivity for peripherals, and there's also an eSATA interface, providing rapid data transfers to external hard drives. Photos from most digital cameras can be easily accessed via the 3-in-1 media card reader, and backed up to a tri-format DVD rewriter. Considering its price, the Satellite Pro A300-1OQ is a deeply impressive device. Performance could be stronger, but it's impossible to fault its quality and usability, and a comprehensive list of features round it off perfectly.